We offer a nice selection of natural and lab-grown (synthetic or created) faceted gemstones with an emphasis on synthetic padparadscha pink sapphire gems, lab emeralds, synthetic alexandrites, ruby, blue sapphires, colored cubic zirconias (CZs), fancy-color sapphires and other lab gems, as well as unique hand-made informal (casual) and fine jewelry using faceted, intarsia, inlaid, cabochon, and bead gemstones, and meteorites. 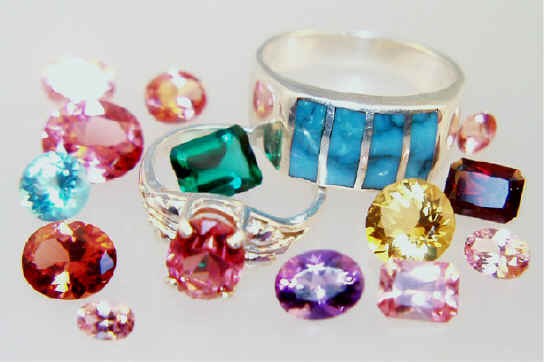 Necklaces, pendants, rings, earrings, and other jewelry types are available. We have a new engagement ring page, to help you decide on the perfect ring! for consulting services in silicon crystal growth.